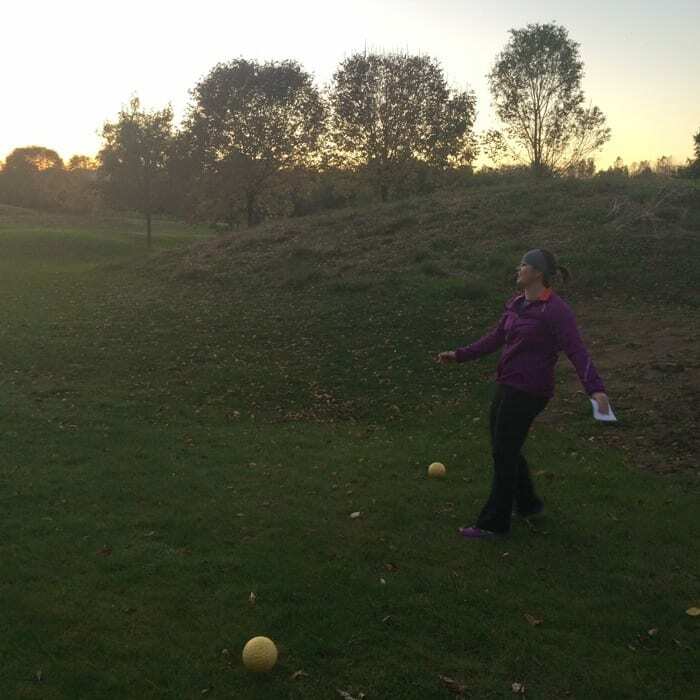 My friend Andi invited my friend and I to join her to try FootGolf for the 1st time. I was really excited to check it out because it’s been on my list to try ever since I first heard about it a few months ago. 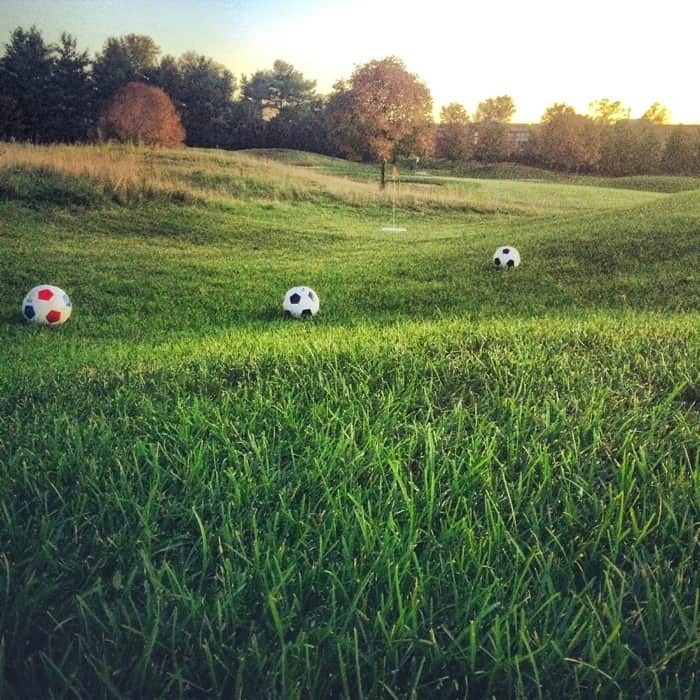 FootGolf is a new sport that combines the popular sport of soccer and golf. 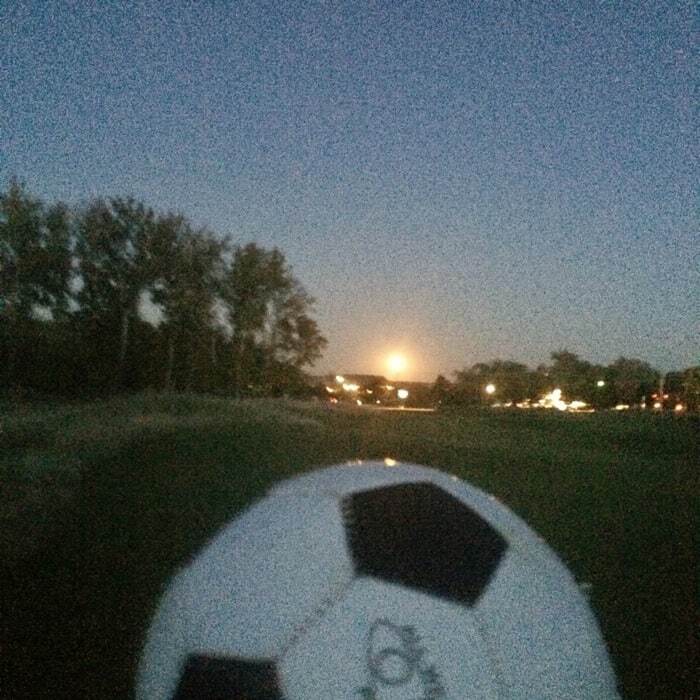 Players kick a soccer ball, trying to get it into a 21-inch diameter circle. 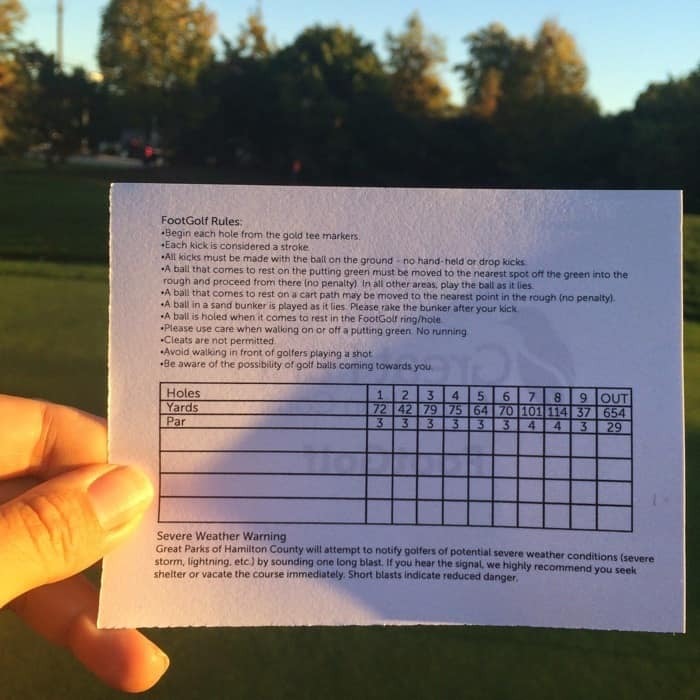 Most of the rules are based on the rules of golf. 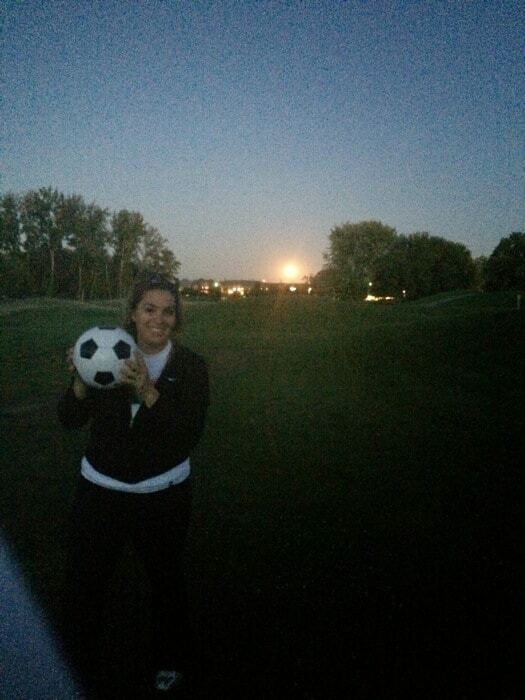 Andi brought a soccer ball with her and the rest of us in the group were able to borrow one from the pro shop. Thankfully no one in the group had any pro soccer experiences under their belt so all of us could just relax and have fun. I gave my first kick a valiant effort and was grateful not to wipe out. 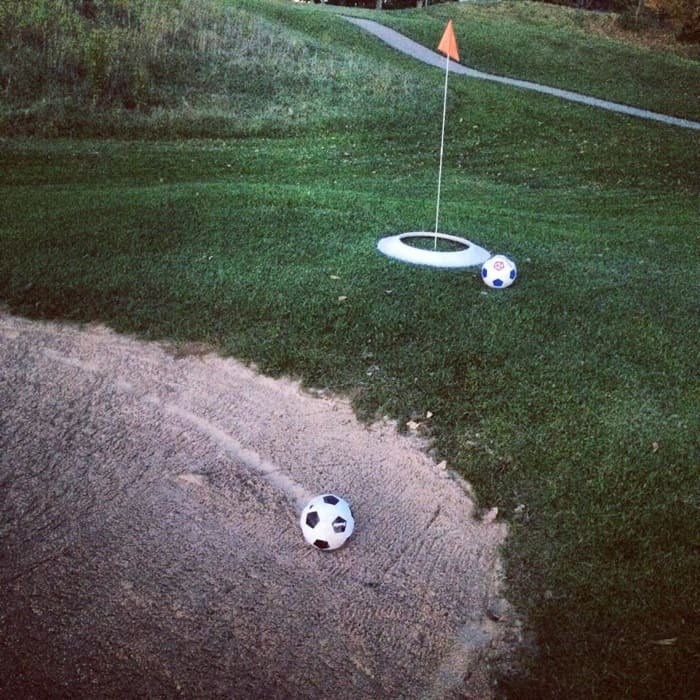 Our FootGolf Course had 9 holes. 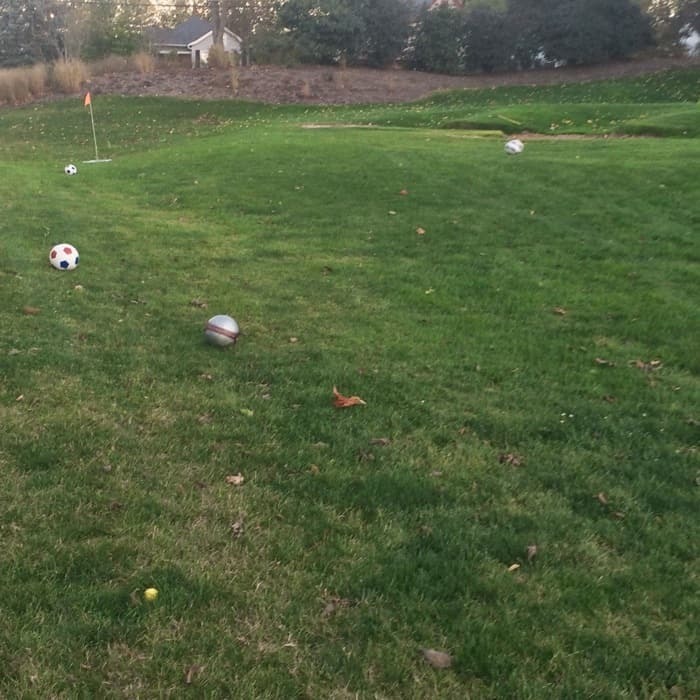 The tees for FootGolf on our course had yellow markers to stand at. Our kicking distance was shorter than the distance that the golfers would tee off from. 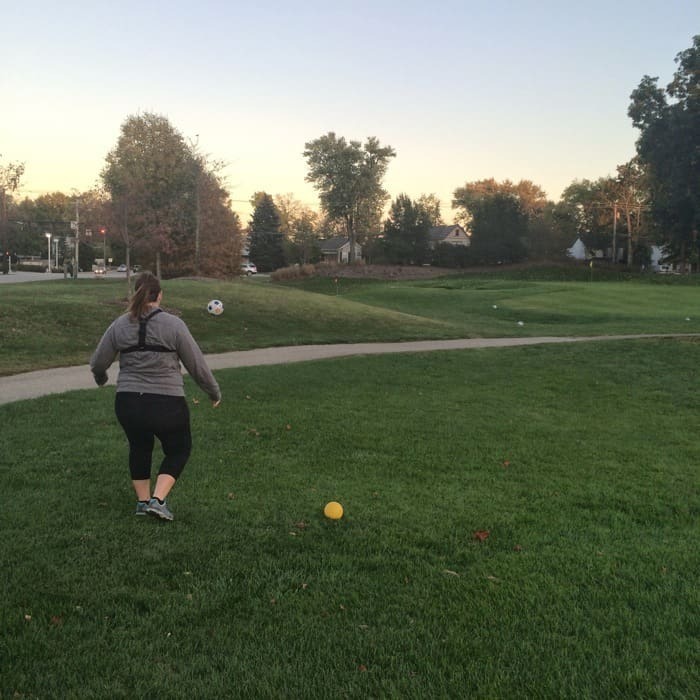 Our group took several kicks to get the ball into the circle which was similar to golf except your foot becomes the putter. 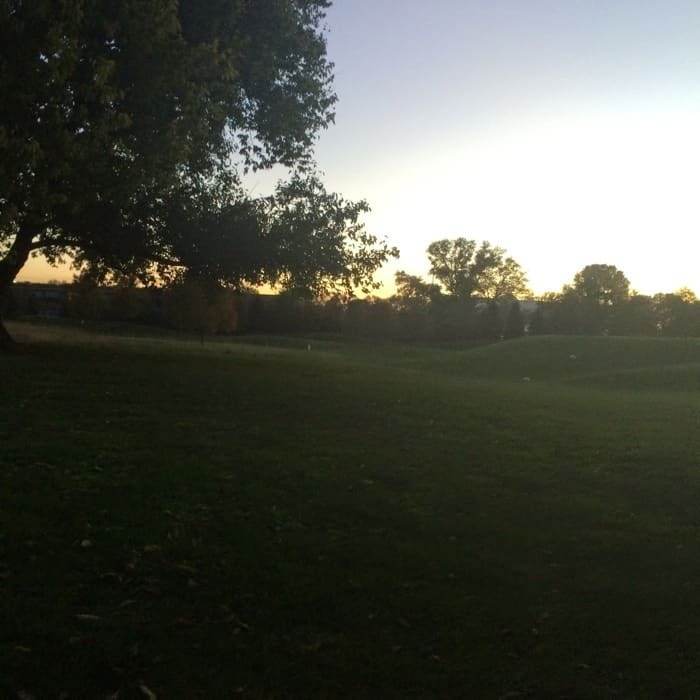 In some ways I felt like I had a little more control over my swing than when I’ve tried golf. We might have had a few balls visit the tall grass and a few sand traps too but they weren’t to hard to get out of. Our group started a little later in the evening so we were on a time crunch to finish before we ran out of light. Thanks to Andi from Udani.com for inviting us to play. Unfortunately, our group shot turned out blurry but I wanted you to see a picture of the four of us before we turn pro. 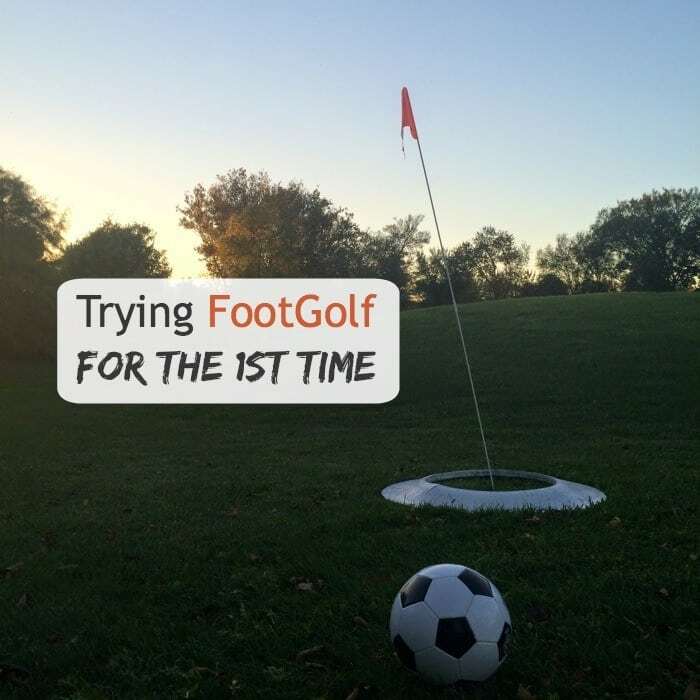 We had a great time trying FootGolf for the 1st time and this definitely won’t be our last. 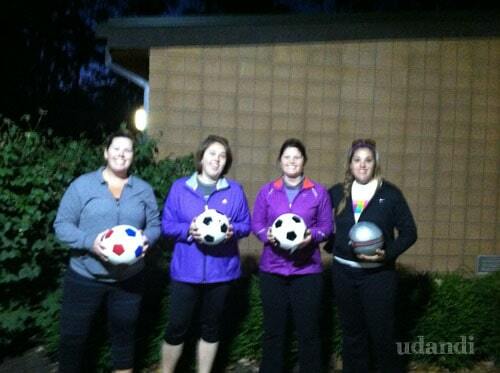 It’s a great outdoor activity that’s also FUN! 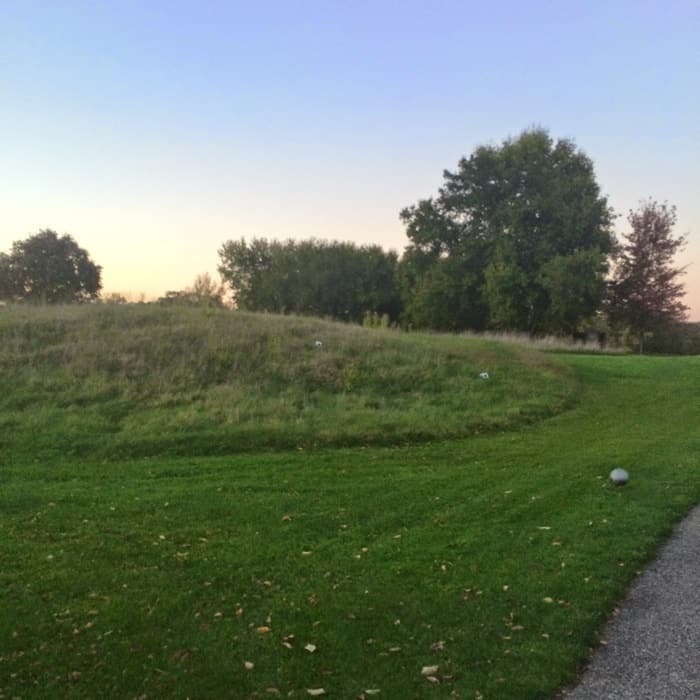 Little Miami Golf Center is located at 3811 Newtown Road, Cincinnati, Ohio 45244. 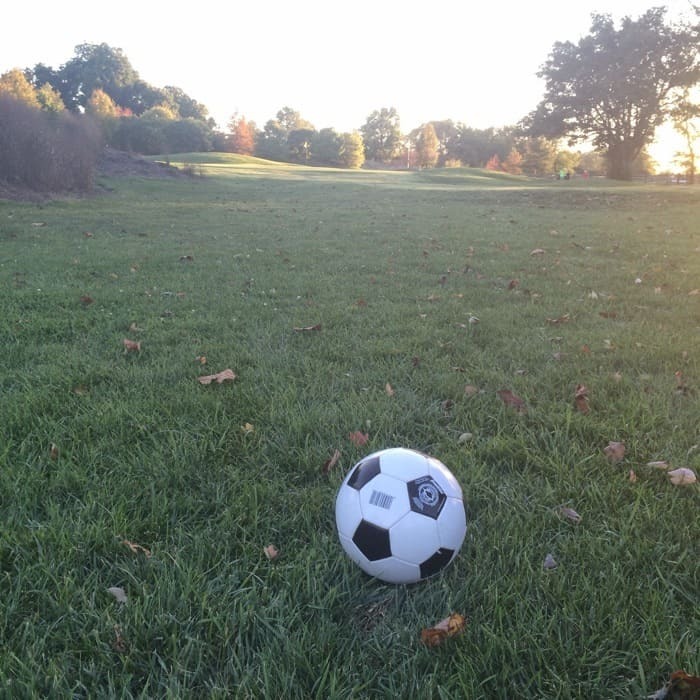 You can find a FootGolf course near you here.